I wanted to talk a bit about my motivation for tomorrow's race. My brother in law, Jim, was diagnosed with melanoma about two months ago. The journey with cancer has already been long and hard on their family. There are still hard days ahead with chemotherapy looming on the horizon. Jim & Chris have been amazing to watch in how they've handled this challenge. There are no quick fixes or easy answers, yet they stay positive & strong. Despite bad news and discomfort from surgeries, they press on. I think about this when I run. My training over the last two months has given me plenty of time to think & pray. 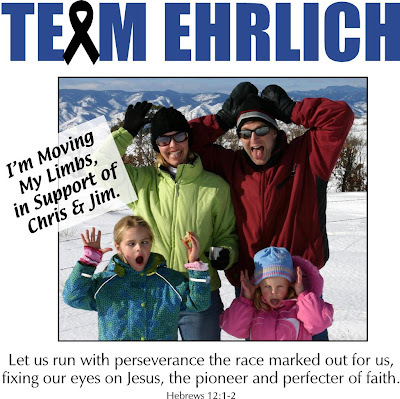 I'm inspired by their perseverance and I intend to use their inspiration to push through the adversity of the race. My marathon will be over in about three and a half hours (hopefully! )...while their marathon will continue much longer than that. I'm proud to be on their team and help cheer them on to the finish! A big thanks to Tanya for designing t-shirts for me and my whole family to wear tomorrow.